Adam Morrison pictured alongside his favourite player Conor McDermott, before training got underway on Sunday morning. Derry City’s No. 1 fan, Adam Morrison, enjoyed a ‘dream come true’ thanks to the Brandywell club on Sunday. The young Oxford Bulls player took part in the Candy Stripes’ pre-season training session which came about after a chance meeting with Barry McNamee’s father, Tony. 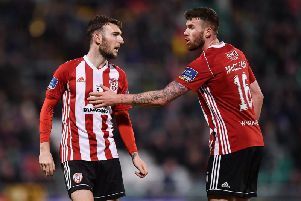 Adam’s father, Kevin - another Derry City fanatic - decided to visit the Brandywell to watch the club train and before he knew it, Adam was warming up with ex-Celtic winger Paddy McCourt, Jamie McDonagh and Conor McDermott. “Adam was down in Letterkenny last week to see Donegal Down Syndrome’s new footballing programme which has started in conjunction with the Glasgow Celtic Foundation. Whilst there he met Tony McNamee and he was telling Adam about Barry signing for Derry so Adam wanted to see Barry in action,” explained Kevin. “So I took him over to training to see if he could see Barry playing but when we got pitchside, Paddy McCourt, who’d trained with Adam and the Oxford Bulls back in 2016, called him onto the pitch to meet the players and take part in training. “He had a kick-about with Jamie McDonagh and his favourite player, Conor McDermott and even got to take a penalty against Peter Cherrie - which he scored! Adam Morrison pictured with Derry City manager Declan Devine before Sunday's training session. “Paddy arranged for a full squad photo with Adam front and centre and he got a few more pics with some of the players and the boss himself, Decky Devine. Morrison said he could’t thank the Brandywell men enough for a wonderful gesture which made his son’s day. “The wee man hasn’t stopped talking about it all day. Derry were top class and treated him like royalty. Adam Morrison pictured alongside Derry City midfielder Ciaron Harkin, before training got underway on Sunday morning. Derry City players Patrick McClean, Eoin Toal, Conor McDermott, Paddy McCourt and Jamie McDonagh chat with Adam Morrison before training started on Sunday.